All that scratching and licking your dog is busy doing can get annoying—now imagine how your poor dog feels! It’s no fun for anyone when it comes to skin diseases in dogs, and there are quite a few of them that could be afflicting your pooch. Here’s what you need to know about the top common skin problems in dogs, including signs and types of treatments. The signs may vary depending on the type of disease or infection that’s causing the problem. Different skin issues can also have similar symptoms, which is why it’s so important to visit your veterinarian to get an accurate diagnosis and make sure your dog gets the right kind of care. By the way, if you’re ever in need of a veterinarian, you can use our Vet Finder. Remember, you can use any licensed veterinarian in the US or Canada with our plans, and this online search tool can help you locate one in your area. It’s especially useful if something happens to your dog while you’re traveling or if you need a specialist, like a dermatologist, and aren’t sure where to start. 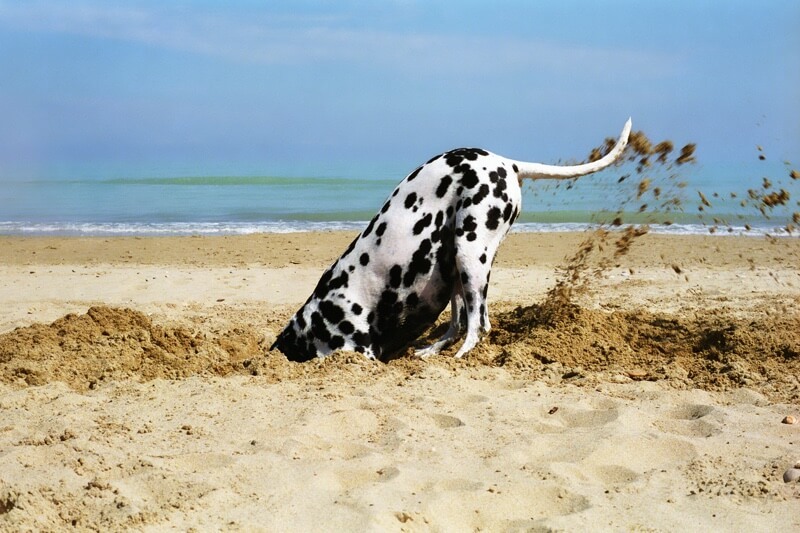 Skin issues in dogs can be caused by a number of problems or even a combination of them. For instance, your dog could have fleas as well as an allergic reaction to flea medication. If your dog is showing signs of a skin issue, one or more of these top eight skin diseases in dogs might be at the root of the problem. Dogs can pick up these unwelcome little hitchhikers while they’re out in the woods, hiking along trails, or even in their own backyards. They can also be transferred from dog to dog, so canines can get them at boarding kennels, dog parks, or home from other dogs in the family. 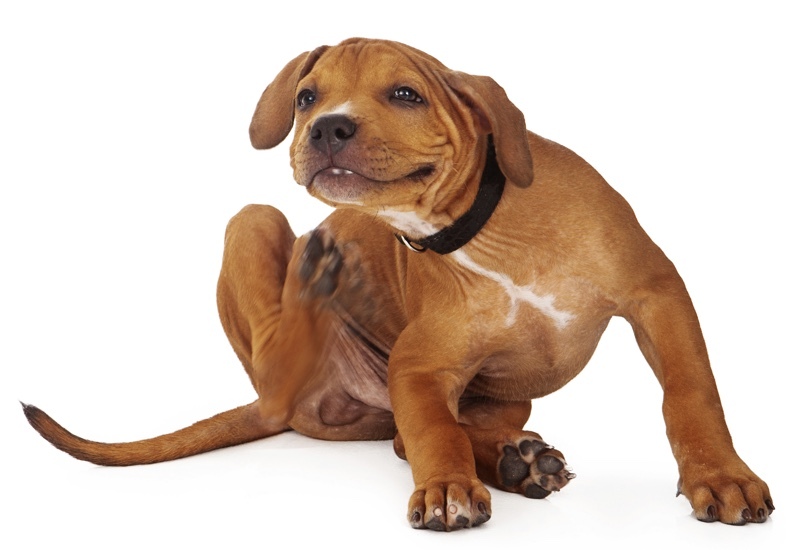 While the fleas themselves can annoy your dog, it’s really the flea droppings and bites that cause skin itching and irritation. Dogs can also have an allergic reaction to the saliva that gets in and around the skin when fleas bite at the skin. One trick is to brush your dog over a sheet of white paper. Try dampening any small specks that appear with a bit of water. If the spots turn red, it could be a sign of flea feces. The crimson color is a result of the blood consumed by the little pest. If you see some sort of bug, but aren’t sure it’s a flea, you can try to grab it between your fingers and take a closer look. A flea will be brownish in color and very hard to squish. If you can squash it easily, it’s probably not a flea. Fleas are a pesky lot, but they can be treated and prevented. There are lots of over-the-counter options available, but keep in mind some dogs are sensitive to flea collars, sprays, shampoos, and other flea products. Be sure to ask your veterinarian for safe flea prevention and remedies for your dog. You may also want to look into treating your house and yard if the problem persists. Like fleas, ticks are pesky little bugs that feed off their canine hosts. They can cause irritation and transmit Lyme Disease as well as other bacterial infections. If you spend time with your dog in places known to have ticks, you should look him or her over carefully when you’re done—just like you should do for yourself. Have your dog sit or stand in front of you and check through the coat. Ticks can usually be spotted easily with the naked eye. If you see one on your dog, it will need to be removed completely. Typically, you’ll need to use tweezers to pull the tick straight out. You should avoid twisting the tick since it’s important to get it out cleanly. If the head or other pieces are left behind, they can be difficult to remove and cause an infection. If you’re not sure how to dislodge a tick, talk to your veterinarian about the proper technique the next time you’re at the clinic. You can also ask about safe tick prevention products. Dry skin is another one of the most common skin problems in dogs. You can see if your dog has dry skin by parting the fur and checking for scaly or flaky skin. You may also notice redness and inflammation from scratching. Environment – Dry skin may be more prevalent in areas with low humidity. It can also be more of a problem in the wintertime when heaters are running and drying out the air. Allergies – Allergic reactions to shampoos, fragrances, smoke or other allergens can also cause dry skin in dogs. Dehydration – If your dog isn’t getting enough water during the day, his or her skin may start to show the effects. Make sure your dog always has clean water at hand and be sure to bring plenty of fresh water along when you go on long walks or hikes. Dietary Issues – While too much fat in a dog’s diet can cause health problems, a lack of healthy oils can result in dry skin. Some commercial dog foods process out the healthy oils that can help promote healthy skin and fur. Be sure to look at ingredient lists and talk to your veterinarian about recommended dog food options. Also referred to as canine scabies, this type of mange can be spread easily between dogs. They can even be transmitted to people although they typically don’t survive on human hosts. Dogs with sarcoptic mange may be restless and scratch incessantly, which can cause bald patches, inflammation, sores, and scabs. It often appears on a dog’s face, ears, and legs, but it can spread all over the body. This kind of mange is not usually contagious. The mites that cause it can be transferred between dogs, but they’re often absorbed into a healthy dog’s existing mite population and cause no problems. Demodectic mange can result in bald spots, scabs, and sores. If you suspect your dog has mange, visit your veterinarian who can examine your dog and recommend an appropriate course of action. Treatment can include oral or injected medications, special shampoos, or dips. If your dog has mange, you should also clean or replace any bedding, blankets, and collars to help avoid re-infestation. Hot spots, which are more technically known as acute moist dermatitis, are red and inflamed areas of the skin that can feel hot to the touch. They’re often found on a dog’s chest, hips, or head and can be brought on by a number of problems. For instance, allergies, insect bites, infections, or excessive licking can cause hot spots. If your dog has hot spots, you should reach out to your veterinarian for a recommended treatment. The hot spots may need to be cleaned and bandaged. The underlying issue will also need to be treated, or the hot spots may get worse or reoccur. One of the more common skin infections in dogs is a yeast infection. This type of infection often happens around the ears or paws since yeast likes cozy places to grow. If your dog has a yeast infection, you may notice him or her pawing at the ears and chewing the paws as well as irritated or discolored skin. Treatment for yeast infections can include medicated baths, ointments, or oral medications. Other common skin infections in dogs include impetigo and folliculitis, which can result in bumps, sores, and scabs. With impetigo, blisters often appear on the puppy’s tummy. Both of these infections may be taken care of by your veterinarian with topical solutions, medications, or other treatments. Like people, dogs can have allergic reactions to a number of common household items from shampoos to cleaning supplies. They can also be allergic to fleabites and a variety of foods. An allergic reaction may show up as a rash on the skin, which can be itchy and irritating for the dog. To treat an allergy, you’ll need to know what’s causing it first. Your veterinarian can help you figure this out and suggest a course of treatment. Sometimes creams to relieve the rash or medications to help prevent the reaction can be useful. You should also try to keep your dog away from the allergen if that’s at all possible. To treat an allergy, you’ll need to know what’s causing it first. If your dog has ringworm, he or she actually has a fungus, not worms as the name suggests. The “ring” part of this disease refers to the circular looking patches that form on the infected dog’s skin. Dogs with ringworm may also have scaly skin, bald patches, and inflammation around the rings. Puppies are often susceptible to ringworm, which can be passed between dogs at shelters, boarding kennels, or in the home. Skin issues, particularly lesions or infections that won’t seem to clear up, can point to an underlying illness. For instance, Lupus is an immune disease that can affect dogs as well as people. This disease causes the body’s immune system to turn on itself. Lupus is often recognized by hair loss or discoloration at the top of the nose as well as skin issues on the face and paw pads. You should have your veterinarian look at any concerning skin issues your dog might be experiencing, especially if it’s been going on for a while. If the skin issue is being caused by an underlying sickness, it’s not likely to go away until the ailment has been addressed. Learn about 5 common dog illnesses. Interestingly enough, dogs aren’t sensitive to the oil found in poison ivy that can cause a reaction in humans. However, this allergenic oil can be carried on your dog’s coat and passed to you or other members of your family and cause an itchy and painful rash. For this reason, it’s important to clean the oil off of your dog’s coat if he or she has been near the leaves of the poison ivy plant. Be careful not to expose your skin to the oil. Wash your dog carefully wearing gloves and a long sleeve shirt. Dispose of or wash everything thoroughly when you’re done. An ASPCA Pet Health Insurance plan can cover treatments for skin issues, including creams and medications. It can also help you manage the cost of an underlying illness that might be causing the problem. Our wellness options even offer coverage for flea prevention. For instance, Colleen found ASPCA Pet Health Insurance very helpful in covering the costs related to her dog’s itchy skin, allergies, and other health issues. 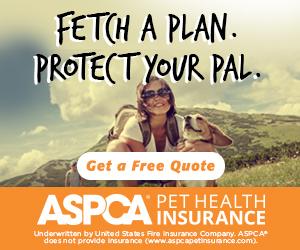 Find out what you should know about pet insurance. 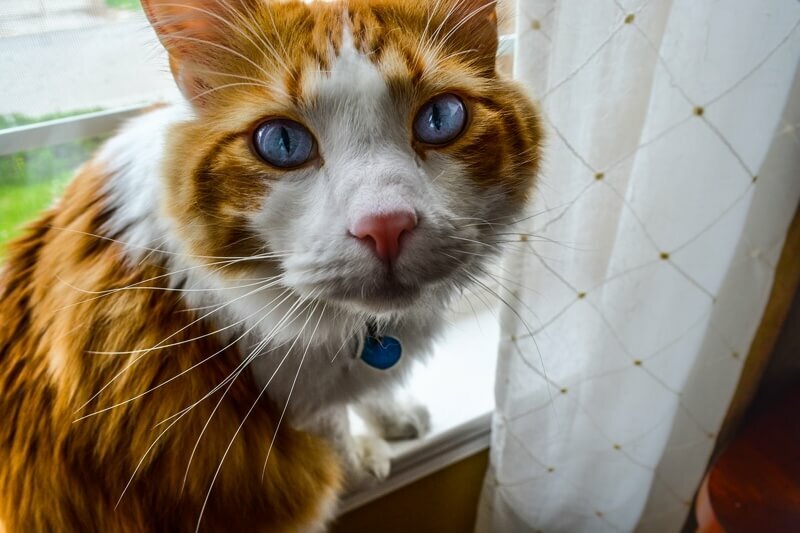 “We rescued Oliver 3 years ago and being unsure of his history decided to get pet insurance. After asking around and doing some research online, we felt ASPCA Pet Health Insurance offered what we needed at a reasonable premium. After Oliver was all cleaned up and vetted, we noticed he had some skin issues, such as scratching and scabs, weepy eyes, and reverse sneezing. We brought him to our vet who said he has allergies. He gave us recommendations and a couple of prescription medications, including a special shampoo. It helped, some, but he was still suffering from itching and ear infections, so our vet recommended allergy testing. Well, our poor dog was allergic to so many things that we now try to avoid, and we're happy to report that he's doing so much better with controlling his allergies. Unfortunately, he’s had other health problems come up including diabetes and eyesight issues. We don't know how we would have paid for all of Oliver’s great care had it not been for his ASPCA Pet Health Insurance plan! Submitting claims and receiving reimbursements have been so easy. We were touched by the personal phone calls from their team inquiring about Oliver’s health.